We have bore witness to a new initiative called Euskaraldia in favour of Basque language held in late 2018 throughout all the Basque Country. All Basque speakers have been invited to speak in Basque to whomever and wherever they had a chance for eleven days from 23 November 2018 to 3 December 2018, with a view to encouraging its use. NAZIOGINTZA reported on the initiative following its presentation approximately one year ago (click on the link). This is the first time such initiative has been put into practice, with the organizers planning to repeat it every two years. 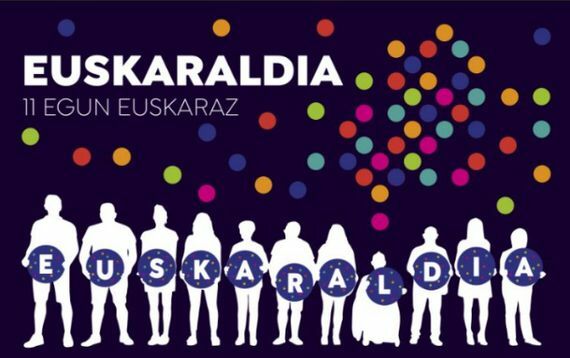 Euskaraldia results from the cooperation between grass-roots movements and the autonomic Basque Government. By means of new synergies, public and private institutions that have turned a cold shoulder to each other for years have designed Euskaraldia, aimed at fostering Basque language use. The initiative has taken place all over the Basque Country, i.e. the Basque Autonomous Community, Navarre and continental Basque Country. 225,000 volunteers have joined in, with a further 405 municipalities from all over the territory endorsing Euskaraldia. It amounts to a large number, taking into account that the figure of Basque speakers is estimated at 800,000 in the Basque Country and there are 686 municipalities. In Euskaraldia, besides the Basque speakers (800,000), those who understood (450,000) were also invited to participate. The first group of volunteers were named Ahobizi, while the second was referred as Belarriprest. The Basque speakers were directed to speak Basque at every opportunity arising, while the latter were requested to keep open when they were addressed in Basque. Both Ahobizi and Belarriprest volunteers showed special badges during the 11 day-period in order to facilitate identification. Ahead of the initiative’s implementation throughout Basque territory, previous years have seen similar activities in different towns. Following these local initiatives, it became clear that street use of Basque language had increased during the days of campaign, and that this augmentation resulted in a higher rate of use once the campaign was over. It followed that the practices many Basque speakers held to operate in non-Basque languages were now shifting, and these changes had consolidated over time. These data made up for a strong driving force behind the launch of Euskaraldia. The results are still not in to make an assessment. The organizers have distributed three questionnaires to all volunteering participants to ascertain the degree in which their linguistic practices have actually changed. The results are due out in a few weeks. There is no doubt that Euskaraldia has made a positive impact on Basque, strengthening its use. The campaign’s publicity has contributed to enhance linguistic awareness among Basque speakers. Given the collective nature of the campaign, the use of Basque in non-Basque speaking areas has not put a strain on individuals, since Basque speakers were making a concerted effort. The initiative includes a groundbreaking experience of bilingual conversation, between an Ahobizi and Belarriprest partner, with the former speaking in Basque and the latter replying in Spanish/French; up to this point Basque speakers have typically given up in front of a non-Basque speaking partner, switching to a Spanish/French conversation. It will be interesting to measure the impact Euskaraldia has left in non-Basque speaking towns and areas of the Basque Country. In Basque speaking areas, where residents use Basque on a daily basis, the impact has remained lower, as it is to be expected. However, not everything is bright-sided in this experience. A critique addressed at this initiative refers to public institutions shouldering the responsibility of using Basque almost exclusively on the population, exempting Public Administration of the responsibility it may hold. We are adamant that full linguistic normalization requires a bolder language policy implemented by public institutions, i.e. Administration should provide for the means to use Basque by any citizen anywhere. Notwithstanding criticism, NAZIOGINTZA salutes Euskaraldia, considering that this groundbreaking experience could provide a landmark for further like initiatives in lesser-used language contexts.